Journal Entry 7/9: Yes, it has been too long since my last entry. I'm sorry for neglecting you, dear journal, but you know how it is. Perched on the hill above Jim Murray's property, the tree-covered mountains of northern New Jersey lie before me. I talked to Jim for a while today about all sorts of things, including his two donkeys (both named Jake). One of the Jakes came right up to another hiker and sneezed into his dinner. I belted out laughing, of course, but the victim did not find it as amusing. Journal Entry 7/10: Morning on the mountain: Sunrise comes quickly. Light drifts down the treetops inch by inch, beckoning the songbirds to rise for their early-morning chores. Fifty miles away, New York City commuters rush to beat the traffic. Jim Murray's donkeys, on the other hand, are slow to rise. They're old now, 25 years old, and have earned the right to take their time. I also refuse to hurry. Mornings on the mountain are to be cherished. They're gone before you know it. Journal Entry 7/25: The trail gave us some easy stretches recently. Short inclines make for happy hikers. One such piece of trail followed a river for about five miles. The river, shallow and wide at parts, and narrow and roaring in others, was a pretty and comforting trail companion. As I walked along I turned to my left and saw an old apple tree on an abandoned farm. People probably lived many years along this river, I thought. I wondered what they were like: Did they say grace before supper, and did the children play in the river, turning over rocks to look for crayfish? I wondered if they would bow down and worship me if I showed them my headlamp. My mind ran through these questions as the trail veered westward, away from the river and into a birch forest. The trees were so tightly packed together that you could almost hear them chanting, "Strength in numbers!" The trail returned to the river after a short while, then veered off again, into the hills. Journal Entry 8/6: Yesterday was great. I slept in, took my time putting up camp, then climbed to a mountaintop with a ski lift. Nearby was a semi-furnished building where hikers are allowed to sleep. I see a hiker poke his head out the door and yell, "Frozen, you want a glass of wine?" Turns out another hiker named Erica left a full box of wine for others to enjoy. We drank, listened to music, and then I hiked on, around 11:30. I spent the night with Erica and John, both hiking the Long Trail. This morning we all had breakfast. Journal Entry 8/19: Today I returned to the Whites Mountains of New Hampshire after a day in town. The climb today was steep as hell — you had to be careful not to fall. The trail is strewn with boulders, roots and smaller rocks. It makes the going slow, but the views of rocky mountaintops make it worth it. I enjoyed "Fire on the Mountain" by Edward Abbey. It makes you think about what in your life is worth dying for. Journal Entry 8/21: Yesterday I hiked Franconia Ridge. Three mountains — Lincoln, Lafayette and another — are all connected by a continuous, above-treelike ridge that overlooks, well, everything. It feels like something straight out of "Lord of the Rings." Journal Entry 8/24: I'm waiting to begin my morning work-for-stay chores at the Lake of the Clouds Hut, about a mile and a half south of the summit of Mount Washington. The Whites really haven't been that hard. They're technical, but so pretty as to distract you from what otherwise might be strenuous. It's going to be chilly out there — below freezing with windchill. It's crazy to think I'm at Mount Washington. Journal Entry 8/26: I lied down in my tent last night and listened to the wind. It came from all directions, swirling, and rising and falling above me. It was not quite strong enough to be menacing, but it shuffled the leaves and bent the branches enough to remind me of its potential. "God, I'm going to miss this," I thought. Journal Entry 8/29: I got moose on my mind. By that I think you can judge that I haven't seen one yet, but that doesn't mean I haven't tried. Last night I tried my damnedest to see a moose, tried all the way till dark, but no luck. I crawled up on a big rock perched at the end of a pond at about 6:30. I waited through the sunset for my prey. It never showed, but I still had a good time watching the beaver swim around, bathing themselves and occasionally hauling little sticks into the water. I passed the time by observing the beaver and reading Sue Grafton — not a bad way to spend an evening. Journal Entry 9/2: Maine isn't f------ around! The hiking has been strenuous, with bits of crazy thrown in. The Mahoosuc Notch was the craziest. I had to, at times, take my backpack off and drag it behind me as I crawled on my hands and knees through small holes tucked under boulders. That was followed by the Mahoosuc Arm, which felt like climbing up the tentacle of a giant rock squid. Yesterday was a bad day — I just felt tired all around, and wanted the thru-hike to be over. I still do, but at least the sun is out, and I'll make a point to enjoy today. I've loved the A.T., but as the air turns colder, I feel like my time is coming to an end. Journal Entry 9/7: I saw a moose! There I was, filtering water, when a guy yells, "Hey, there's a moose across the pond." I dropped everything and ran to see it. It stood up to its knees in water, occasionally bobbing its head below the surface to munch on the submerged foliage. The thing was big, and I mean BIG! — like the size of a draft horse, maybe bigger. 9/7 cont. : On a recent rainy, partly-overcast morning I saw that fall was finally here. Below me, a couple thousand feet or so, stretched a bed of red, yellow and amber trees. From up there, they looked soft enough to sleep on. 9/7 cont. : There are no monkeys in Maine, but there are loons, and I think that's just as good. They wake up, confuse and entertain all who hear their wild call. "Loo, loo, loon!" they yell. You can't hear it and not crack a smile. Journal Entry 9/14: I wonder if I'll ever forget this moment — I guess that's why you keep a journal. I'm sitting on a rock at the end of a lake, and in front of me stands Mount Katahdin. This is my first good look at it, and it's beautiful. Wide and tall, with a rocky plateau-like top, it couldn't be anything else if it tried. My feet feel cool in the water, but my heart feels warm. I started in Georgia, for God's sake. Those early days seem more than 2,000 miles away, more than six months ago. My body has gone through a lot of pain for this view. One step at a time, as it turns out, does get you to places that seem impossibly far away. 9/14 cont. : Side note: Yesterday I fed a bird peanuts right out of the palm on my hand. How cool is that? Journal Entry 9/21: From Eighty Four: Well, I did it. 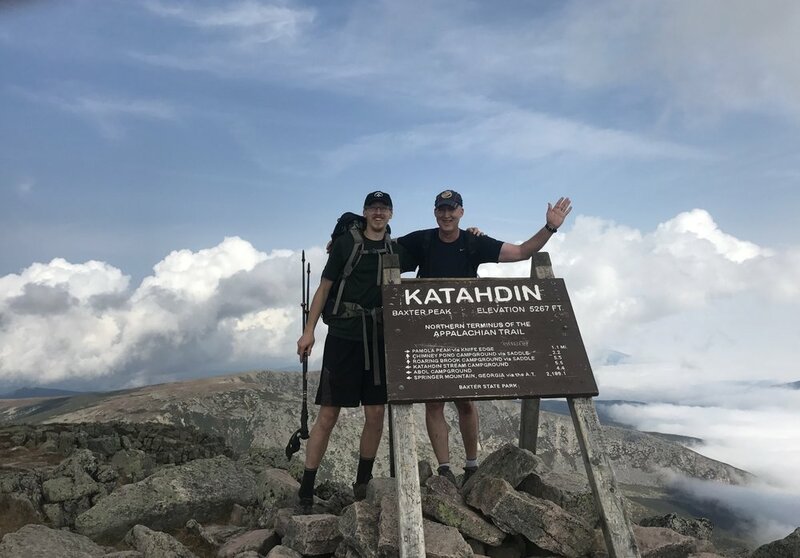 Dad and I summited Katahdin on Monday, September 18, about six months after I started in Georgia. I'm now sitting on the front porch of my parents' house, wondering what to say. I'll start by talking about Katahdin. 9/21 cont. : Dad and I began our ascent at about quarter to seven. The trail started off pretty flat and clear, but quickly we began to gain elevation. As we climbed, the boulders and rocks grew larger. On and on we went. Dad started off strong. By the time we got above tree line, he was a little tuckered, but still doing fine. The trail became pretty technical, so I led the way. We scrambled, crawled and lifted ourselves up above the clouds. The view was spectacular. The clouds spread out below us like grass under your feet. At one point we arrived at the base of a ridge that climbed up the mountain like the spine of a dragon — not exactly inviting. But we proceeded nonetheless, and eventually arrived at the tableland — a plateau near the top of the mountain, about a mile and a half from the summit. We walked on the rocky trail, past Thoreau Spring, and then began our climb to the sign. I managed to hold back tears (something I'm not very good at) as I reached the top. Someone cheered my name, then I touched the sign and climbed on top. I finished the Appalachian Trail. 9/21 cont. : We ate our sandwich lunches with a side of melancholy celebration, appreciated the view, then began our descent. We would take the Abol Trail, which was incorrectly described to me as easy, with stairs and gradual switchbacks. After a water break at Thoreau Spring, we walked to the edge of the tableland and started our way down the mountain. It quickly dawned on me that we had been duped. The trail was steep — a combination of loose, sandy rock and huge boulders. We had to be careful as we picked our way down. All was good, relatively speaking, until I turned and saw my Dad's ankle twist, and watched his body fall forward. There was no stopping it. Mid-air, his torso turned, then slammed into the rocky trail. At first, he said nothing, and neither did I. He groaned a painful and downright depressing noise. "Is your ankle broken?" I asked. He said it wasn't, and I was relieved. We were on the side of an enormous, steep mountain, too precarious for a man with a broken ankle to navigate. He eventually got up. We rested. After our break, we pressed on, albeit a bit more carefully. Finally the trail became more reasonable, and we descended without any other major tumbles. 9/21 cont. : Reflections: I started the trail nervous and unsure of myself, my decision and my future. I ended with confidence built on the foundation of experience. That experience was composed of failures, mistakes, pain and perseverance. The Appalachian Trail was, for me, a forced evolution of character. The woods threw trials and tribulations at me from day one. That never changed. What changed was the way I confronted adversity — from a doubting, panicky scramble, to a cool and practical process. What changed, as time went on, was that I learned how much my body and mind could endure. Problems really are opportunities to learn, not just hurdles to jump over or avoid. At some point, I'm not sure when, I think I realized that I was going to make it, that it would take a hell of a lot to stop me. I focused on the long-term goal of reaching Katahdin, and I think that was a good strategy. Appalachian Trail reading list, cont. "The Big Sky" by A.B. Guthrie, Jr.
"The Way West" by A.B. Guthrie, Jr.
"These Thousand Hills" by A.B. Guthrie, Jr.
9/21 cont. : Reflections cont. : The other hikers taught me to develop self-respect and self-confidence. I think we all shared a confidence and respect for each other, because we all knew what we went through, and all the problems we faced. Being part of that group felt good, and I was able to find an honest, well-earned respect for myself through my respect for others. 9/21 cont. : Reflections cont. : I learned about the woods, though not as much as I would have liked. I think you can learn only so much through pure observation. But I did learn about the behaviors of songbirds, squirrels and black bears, and about the flora of the Appalachian range. I learned about snakes, too, and I became familiar with the trees of the mountains. I learned to love physical exercise, and realized how important it is to being happy. I learned to love sweat, and to feel fulfillment by walking a long distance through tough terrain. 9/21 cont. : Reflections cont. : I believe the Appalachian Trail is a selfish endeavor, and I don't mean that in a negative way. I mean that the purpose is to allow the world to change you, rather than you changing the world. Here's one way of explaining this way of thinking: The A.T. strips away all the stuff in one's life (possessions, friends and loved ones, homes, security, etc.) and leaves one to confront himself. It's just you, a backpack and the woods. Make it work. Of course you make friends along the way, but at the end of the day, it's your own two feet that will carry you to Katahdin. Your friends and family won't get you there, your money won't turn into a magic carpet, and your resumé won't do anything except serve as kindling. The trail doesn't care about your work history, your love life or your SAT scores. It teaches you that if you want to get there, it's on you. Rain? Too bad. You're hungry? So sorry. Maine isn't going to come to you, so you better get hiking. I loved that, and I won't let that lesson go to waste. The trail may end at Katahdin, but the journey does not, and the lessons I learned are not bound up and tangled in the treetops. The trail and its teachings will always be with me. I'll carry them like I carried my pack: always onward, one step at a time.